Vicente Tainatongo was born on 30 June 1937 and entered the service from the Marine Barracks, Guam in 1961. He trained as an infantryman and was assigned to the 1st Cavalry Division in the Republic of Vietnam in 1966. On 30 March 1966, SGT Tainatongo was serving as a squad leader in Company A, 1st Battalion (Airborne), 12th Cavalry, during Operation Lincoln. On this date, his company was assaulting two well fortified North Vietnamese Army companies in an attempt to rescue the crews of two helicopters downed in hostile territory. Sergeant Tainatongo had directed his squad in the assault, successfully overrunning many enemy positions. When the order was received to withdraw, Sergeant Tainatongo, despite heavy casualties, expertly coordinated suppresvie fire to cover the company's retrograde movement. While moving away from the enemy positions, Sergeant Tainatongo realized there were wounded comrades being left behind in the intense fire fight. With several other volunteers, Sergeant Tainatongo again assaulted into the face of the enemy positions, personally eliminating one bunker with grenades and automatic weapon fire. His efforts were successful in evacuating one of the wounded before he was critically wounded himself. Sergeant Tainatongo's courageous leadership, his personal bravery and gallantry in action earned him the nation's third highest award for valor, the Silver Star Medal. Sergeant Tainatongo was awarded the Purple Heart for his combat wounds in this action. 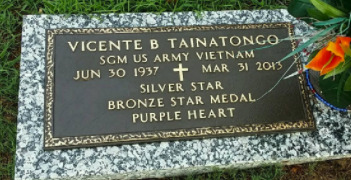 Sergeant Vicente "Ben" Tainatongo returned to serve in the 15th Medical Battalion, 1st Cavalry Division in 1969. Sergeant Major Vicene Tainatongo retired from the US Army in 1984 while serving at Redstone Arsenal, Alabama.